MOAM is excited to announce the following 3 finalists for the Annual Football Student Manager of the Year Game Ball. ​Phillip is a full time student, qualifying him as a student manager, but he is also the equipment director and is the only head equipment manager for Valdosta. Not only does he work football, but this year he has also helped or worked with basketball, baseball and soccer. "Phillip is an extremly hard worker. There is hardly a moment where he is not busy doing something to improve our equipment room. He has managed to make sure all the equipment duties have been completed, never missing a practice, and he has managed to pass all of his classes this semester with high grades. He has also been trying really hard to get our school and equipment room more recognition, and is key in our success with the Helmet Trackers helmet tournament. He is a great leader, and a great example for all of us to follow. This makes him an invaluable asset to our equipment staff. Valdosta State is honored to have him as our equipment manager." Arielle Scavo served her third season working in the Hurricanes' equipment room. She is currently a junior studying sports administration. "Arielle is the rock of the equipment room. In an industry dominated by men, she takes control of our equipment staff and runs the show. Arielle is the first one in every morning, not just the first student, but some days the first person on the whole staff into the EQ room. It is a strange occurrence to not see Arielle in the equipment room. She volunteers her time after practice to help other students on their laundry days, and she is always willing to lend a helping hand to the full time staff to prepare for the next game. Arielle has so distinguished herself on our staff and I can't imagine a home or road game running smoothly without the help of Arielle." 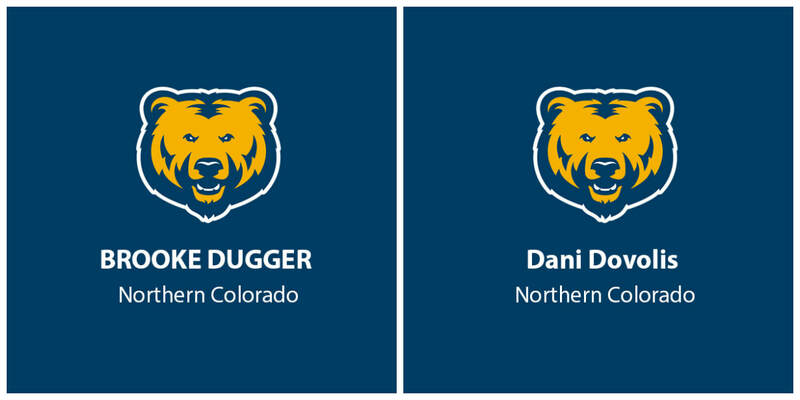 Brooke and Dani both currently serve as football student managers at Northern Colorado. ​"Brooke and Dani together have worked tirelessly this football season and beyond. They have yet to miss a Saturday and Sunday of post game laundry and turn-in. While doing an extremely thankless job they never quit and do it all with a smile on their faces and positivity. Working 8+ hour days and giving up getting to go to football games to work and prep for post game they show their selflessness. They may not be out on the field for practice or the sidelines of a game but all that they do behind the scenes is incredible. Their organization and hard work has allowed for others to go home or not come in on weekends because of everything they have done and all the work they have put in. They have truly gone above and beyond what they have been asked to do. " The Voting Period Has Ended!